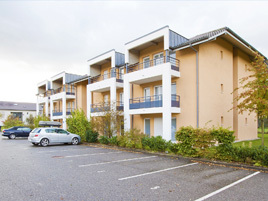 Located on the outskirts of Geneva, close to the Geneva Cointrin international airport, the international organizations, CERN (European Organization for Nuclear Research), the Residhome Carré d'Or hotel residence offers you fully-furnished and equipped apartments with personalized service to maximize your comfort. With Mont Blanc within reach and nestled near the Jura mountains (less than an hour's drive), the residence offers you an exceptional setting. Switzerland is also very close by with Geneva, an attractive and innovative city. Come take advantage of the many annual events (the International Car Show in Geneva, the Montreux Jazz Festival, the Lake festivals…), including the Geneva Fair. The aparthotel has 135 apartments, ranging from studios to two-bedroom suites. The suites are furnished, fitted-out, and include a living room with a convertible sofa that sleeps two, or a double bed, or twin bed, a flat-screen television with satellite, a workspace, a fully-equipped kitchen (glass ceramic stovetop, dishwasher, refrigerator, microwave, dishes…), and bathroom.